Still using spreadsheets to manage your marketing projects? Or maybe a task management tool? There’s nothing wrong with either but when a project gets complicated you need more than this. How about a project management tool that provides functionality specific to marketing? 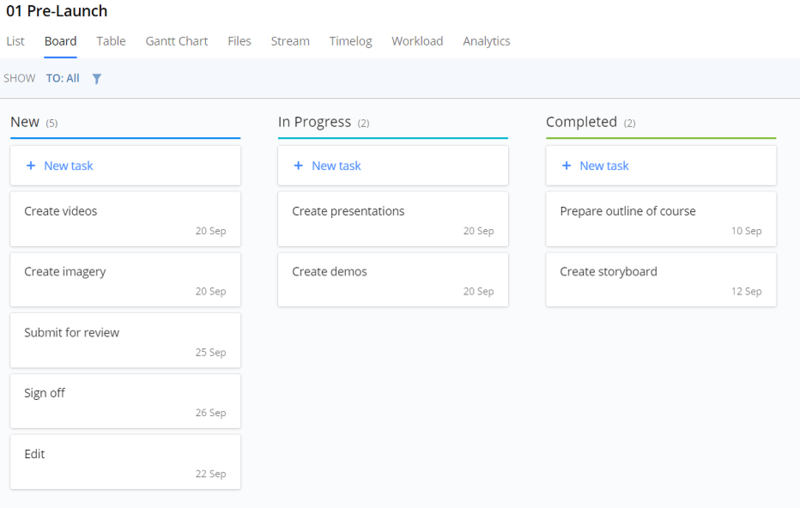 Wrike is an online tool built to help you manage your projects. If you want to stay on top of all your tasks, work with a group of people, have clear visibility into where you are and what needs to be done all while staying organized, then this may be a tool to consider. If software is not simple to use there’s no place for it on my shelf! We don’t have time to try and figure out new software any more. Luckily Wrike doesn’t fall into either of these traps. It provides a really nice user interface and it’s relatively easy to use. The only negative side is it doesn’t provide context-sensitive help (e.g. help available which is specific to the screen you are on). The easiest way to understand the functionality that Wrike has to offer is to set up a project. We’re building a blog strategy course at the moment so we used this as an example. To create your first project, you’ll just need to click on the plus icon at the top horizontal menu and choose Project. After you name and create your project, you’ll be able to set a start date and end date, add a description, share with team members, and upload files and add notes so they’re easily accessible by anyone working on the project. 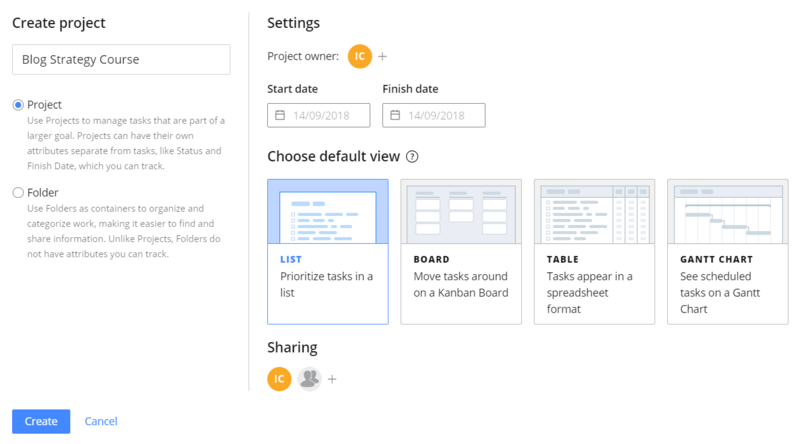 Next you’ll start organizing the work into folders (which can contain subfolders, tasks, and subtasks) so all the relevant information is grouped together and is easy to locate and share with your team. For our project, it made sense to divide the work in 3 stages and create folders for Pre-launch, Launch, and Post-launch activities so we know exactly what needs to be done at each stage, who needs to do it, and in which timeframe. This worked for us and for this particular project, but you can choose to categorize your work in any way that suits you e.g. by team or by client. We’ll cover Folders in more detail later on in this post. At the Project level, you can keep an eye on the status and due dates of the project separately from the individual tasks. Basically, you get a high level overview of the project’s progress. A nice little feature here is that you can assign a status to your project (green, yellow, red, on-hold, cancelled, and completed) and change it accordingly over the course of the project. A project in Wrike also has different views. This means that you can switch from List, to Board, to Table, or Gantt chart at any time. These are all different and extremely useful ways to keep track of your project. If you’re a fan of Kanban boards and you used Trello or similar tools a lot, you’ll love the Board view. 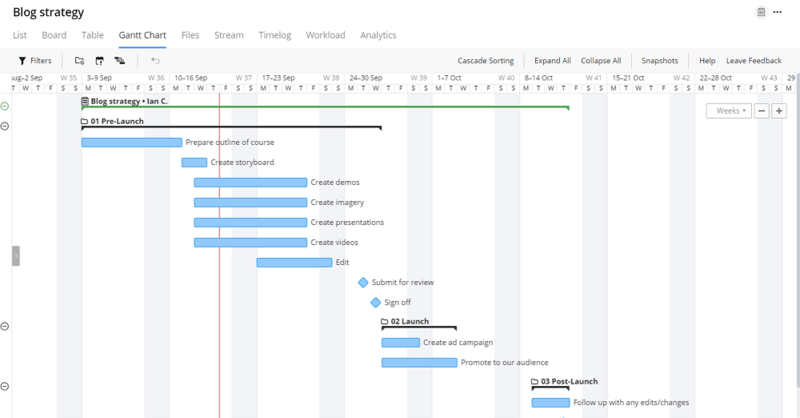 If you want a more visual way of tracking how your project and associated tasks are scheduled, you’ll be switching to Gantt chart view a lot. Apart from these different views, the Project’s top menu also contains Files (where you can see all files attached to the project), Timelog (if your team is logging time spent on tasks), Workload (calendar of your scheduled workload), and Analytics (different charts, including Performance and Work Progress). Now, let’s take a closer look at the available Analytics as this is where you’ll get all the information you need to assess if your project is advancing the way you intended. The Analytics tab shows you a snapshot of the project’s tasks on the left, including the number of tasks and milestones, and the charts relating to the progress of the project on the right. Now, the charts that Wrike automatically generates based on the available project data may not be enough for your specific reporting needs. So, for example, if you need to report on things like tasks by users the good news is that there’s also an option to create a new chart. In this case you can choose to show finished, ongoing, cancelled, or overdue tasks. A nice way to track how your team is handling the workload and if they’re delivering on time. We’ve touched upon Folders earlier and mentioned they’re a great way to categorize your work i.e. group and save tasks and information in a way that’s easy for everyone to find. 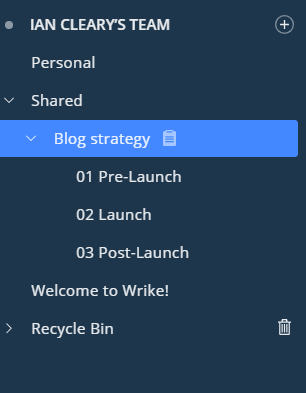 Now let’s see how to create and work with folders in Wrike. To create a new folder, simply click “+” in the top horizontal menu and select “Folder.” Name your folder (make it clear e.g. a client name, department, work stage, etc.) and choose the default view. Like with Projects, a folder can have different views including List, Board, Table, and Gantt chart. After choosing a default view, you’ll select people you want to share your new folder with and click ‘create.’ It will show up in the Folder three on the right hand side of the dashboard. As you can see in the bellow screenshot, my Pre-launch Folder is already populated with tasks. 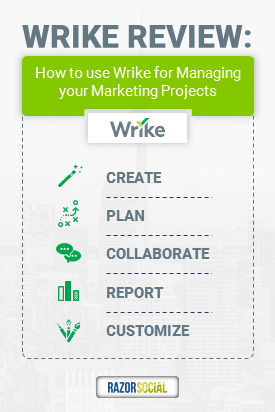 Since tasks are the actual activities you team members need to complete for a particular project, I’m sure you’ll appreciate the capabilities that Wrike offers here. You’ll have just the right tools to manage, assign, and track all the tasks. Plus, with the right click on a task, you’ll get more options including to reschedule or add importance level. All of these capabilities should really allow you and your team to stay organized and on schedule. Once you add in more Folders and populate them with associated tasks, you may want to do more to better organize your Folder tree. This is where color coding comes in. Just right click on a Folder, hover over “Color” on the dropdown list, and choose a color from the available options. The color you pick is immediately applied to the Folder, it’s that easy! 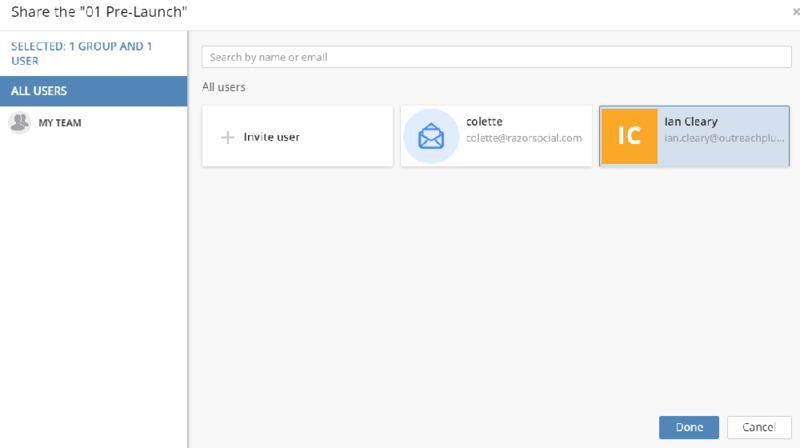 You can also share a folder with a group or individual users by sending them an invite. You can do this with right click on a Folder > Share. In marketing, we often manage similar projects and tasks and creating them from scratch over and over again is not the most efficient way of doing things. The team over at Wrike knows this well, so they enable their users to create templates that they can use to quickly get moving on their next project or task. Here are their tips on how to do this. Create a folder and call it “Templates”. Inside this Templates folder, create a subfolder for a project you often repeat and add the tasks within this folder. These will be typical tasks necessary to complete this type of project. Add project description so anyone working on it will know exactly what to do. Learn more about how to start a project from Template. This tool is definitely one to test out for individuals and teams who regularly handle multiple clients or projects at the same time. It’s great for busy marketers and agencies who appreciate having one tool to keep track of their projects and tasks. Given how comprehensive functionality of Wrike is, it may be a bit overwhelming at first, and you may find a less complex tool more fit for your needs.